Just off I-80 at the Marshalls Creek exit. 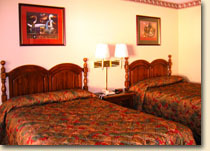 Conveniently located at the eastern entrance to the Poconos - near golf, shopping, restaurants, kids attractions, and skiing. This hotel is on our list of "places we would stay at ourselves". Near these attractions: Shawnee, Great Bear, Mountain Manor & Delaware Water Gap golf, Shawnee ski area, Shawnee play water park, Thunder Creek Quarry amusement park, Water Gap hiking, Bushkill Falls, Canoeing/rafting & kayaking on the Delaware. 12 min to shopping at the outlets, 5 min to Stroudsburg nightlife, and near the entrance to the Delaware Water Gap National Park. The entrance is a Garden Courtyard theme. The interiors of the rooms at the Shannon have recently been renovated to really nice standards (We were surprised how nice, during our inspection) with a limited number of whirlpool rooms. 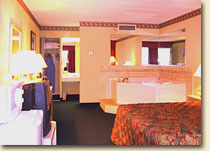 Rooms are a little bigger than most standard hotel rooms. 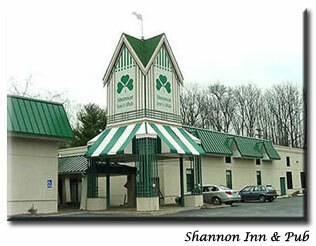 The on site restaurant has an Irish Pub theme with entertainment on weekends ( a fun night out). The Shannon is near other restaurants like the Landmark Cafe (The Best Bar for Grown ups in the Poconos) and Saen (The Best Thai restaurant) The indoor pool is in it's own separate building and is very large. 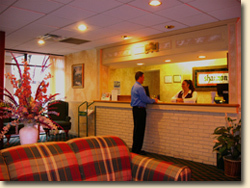 Refrigerators are available for a $10.00 charge upon check-in. Take 80 East to Exit 309. Get off and take 209 North Bushkill. Shannon Inn is ¼ mile on the left. West on I-84 to 209 South. South on 209 to East Stroudsburg and Route 80. The Shannon Inn is on your right. North on the NE Extension (I-476) of the PA Turnpike to Exit 33 (Lehigh Valley). Proceed East on Route 22 to Route 33 North, which then meets I-80 East. Take 80 East to Exit 309. Get off and take 209 North. Shannon Inn is ¼ mile on the left. Take Interstate 81 South Interstate 380 South to Interstate 80 East. Take 80 East to Exit 309. Get off and take 209 North Bushkill. Shannon Inn is ¼ mile on the left. West on I-80 to Delaware Water Gap to bridge crossing into PA. Continue to Exit 309 --- Marshalls Creek, get off the exit and take 209 Shannon Inn is ¼ mile on the left.